Apple Socks from Bridleway Equestrian. These onesize (UK adult shoe size 4-8) ladies knee socks feature cushion loop terry foot for comfort. 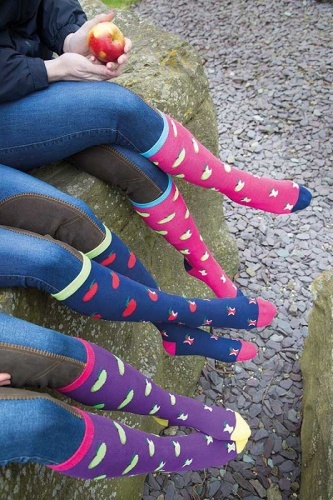 Available in Navy, Pink and Purple and feature a fun apple design with the apple being eaten as the pattern travels down the leg. Made with 75% cotton, 20% polyamide and 5% spandex to stretch to give a great fit.